These are some of the errors that I have run into that have made me either laugh hysterically or want to punch someone. I will add more as I find them, right now the collection is not that impressive (I think I have more, just can’t find them yet). 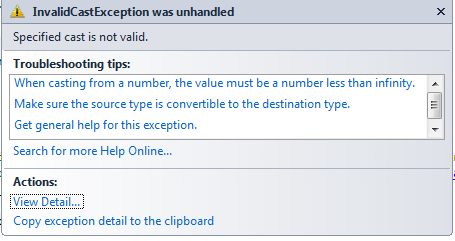 This error occurred when I wasn’t even dealing with a number. I think it must have been an inner exception or something that trickled its way up… somehow. Very irritating. This I just found to be funny. This was due to a Visual Studio 2008 bug, it is hard to explain how it would happen, but when it would I would crack up. To fix it just delete all of your break points or ditch your solution file. CATASTROPHIC FAILURE!!!!! 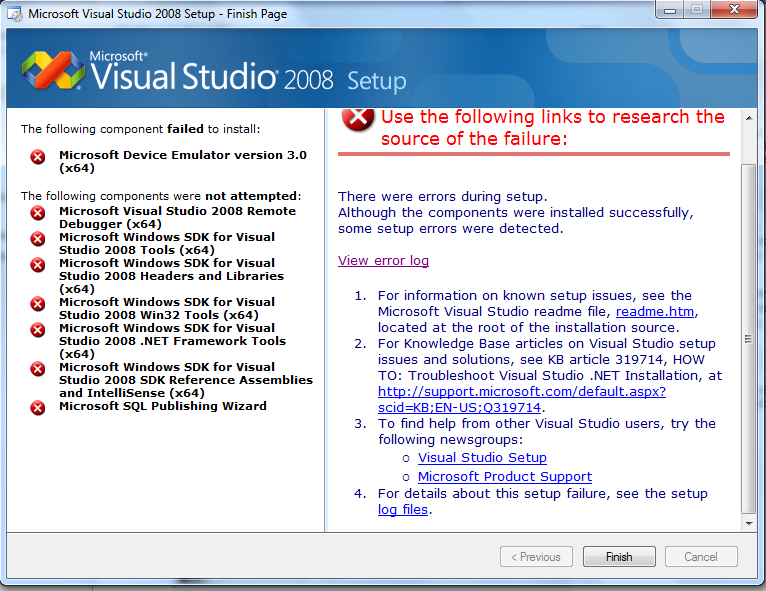 I would see this every time I would try to install visual studio 2008. Visual Studio was installed for the most part but the debugger wasn’t! During the SQL Server 2008 R2 all in one installer (or maybe it is another one?) this would happen. Who would have know that deleting the exact folder it is complaining about would have fixed the problem! This is a legitimate error, my gripe with it though is that it could have had a useful tip along with it like: “Hey stupid you are trying to sum a string column!” and then tell you WHICH column is the culprit. Sometimes you don’t realize that your number column is accidentally being treated as a string column. Stuff happens. 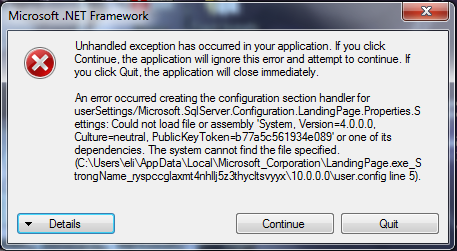 Yay Visual Studio 2010 still has continued the Catastrophic Failure error message box! This happens when a file cannot be located and you double click on the error message to view the missing file. CATASTROHPIC!!! This is a magical error… because you don’t know what you are agreeing or disagreeing to. Thanks Outlook 2010. I got this error while editing HTML for an ASP.Net web app. It happens more frequently than I’d like. Pretty useless because it tells you that you can log it after it happens. Why not show me the error message at least? 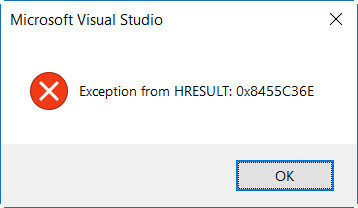 TFS 2012 returns this error in Visual Studio 2012 when you have not really saved your files that you are trying to check in. Do a save all, a build or both. Wow… what an error message. This is by far one of the most useless errors of all time. It tells you nothing because the problem causing it is just so broad. It can be a lot of different factors. 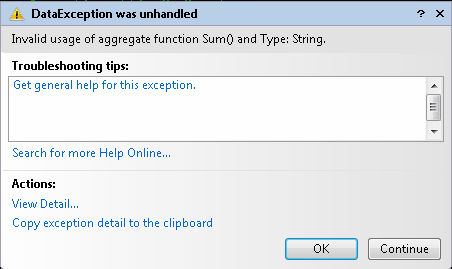 Visual Studio 2012 returns this error when you are having a problem with your solution TFS bindings and you just continuously ignore the errors about needing to fix your bindings. Eventually VS gets fed up I guess and this is the best it can spout back at you. 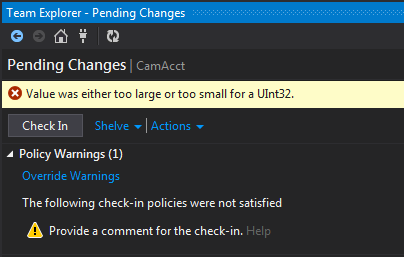 Visual Studio 2015 returns this error after corrupting your source *.cshtml file with a botched rename operation. Read about it here. It would have been nice if they could have provided a line number of what was causing the problem. Visual Studio 2017 returns this error, for what seems to be randomly, when you save your markup file. Difficult to reproduce and easy to ignore since it is so detailed.